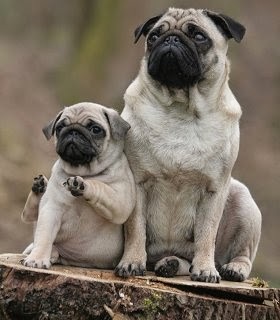 Pugs often are described as a lot of dog in a small space. These sturdy, compact dogs are a part of the American Kennel Club's Toy group, and are known as the clowns of the canine world because they have a great sense of humor and like to show off. Originally bred to be a lap dog, the Pug thrives on human companionship. The moles on a Pug's cheeks are called "beauty spots." His muzzle or mask is black, with a clearly defined "thumb mark" on the forehead and a black trace down the center of the back. His ears are smooth, black and velvety. He has a characteristic undershot jaw and a tightly curled tail. 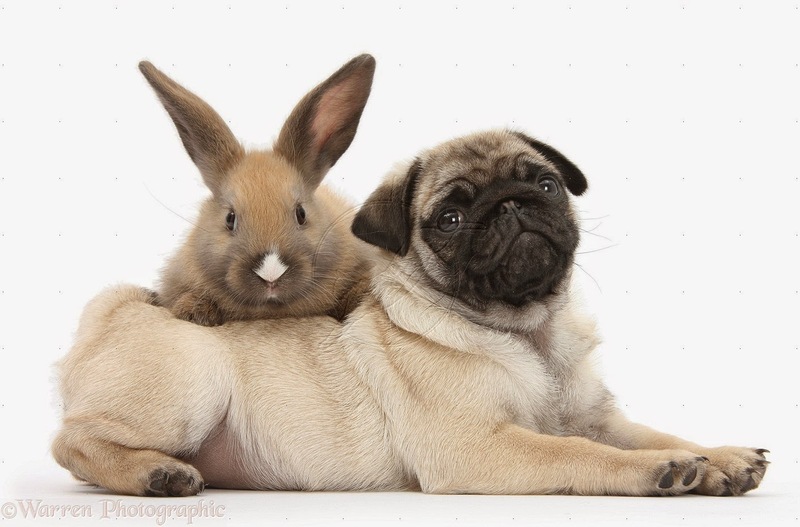 The Pug is among the largest of the Toy breeds. He's lively and loves everyone, and his alert nature makes him an excellent watchdog. This breed snores and snorts, a by-product of his flat face. Learn to think of the noise as a lullaby. Pugs can't tolerate high heat and humidity because of a short muzzle. When your Pug is outdoors, watch him carefully for signs of overheating. Pugs are definitely housedogs and should not be kept outdoors. 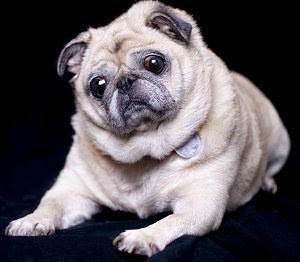 Multum in Parvo, meaning "a lot in a little," is the official motto of the Pug and sums up its description. The Pug has had various names throughout the years, including Mopshond in Holland, Chinese or Dutch Pug in England, and Mops in Germany. But the word “pug” is thought to have come from the Latin pugnus, meaning fist and attributed to its clenched fist-like head, or from the 18th-century marmoset "pug" monkey, which purportedly appeared quite similar to the dog. Although its exact ancestry is not known, many consider the Pug as one of the first breeds miniaturized in Asia. China is the earliest known source of the breed, where Buddhist monasteries of Tibet favored the Pug as a pet. 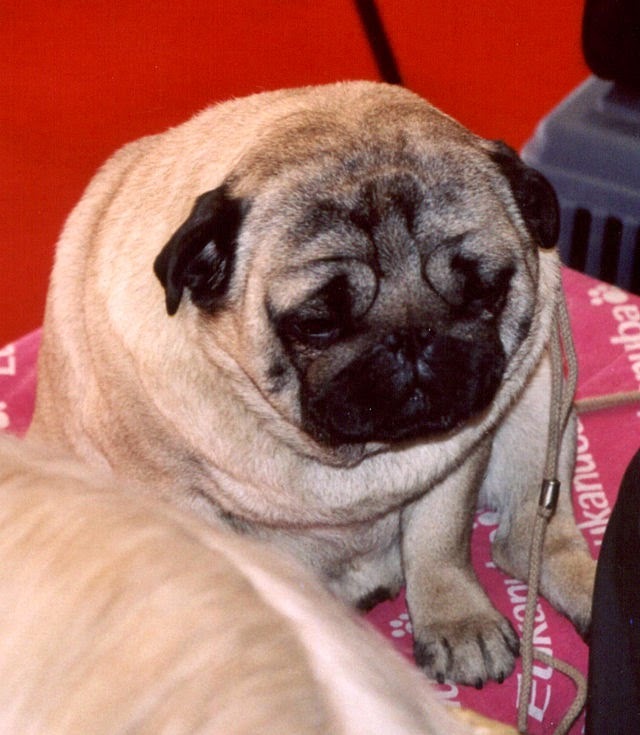 The Chinese considered the Pug's facial wrinkles an important feature of the breed, referring to it as the "prince mark" because of its similarity to the Chinese figure for prince. Brought to Holland by the Dutch East India Trading Company, a pug would become a pet to William I, the Prince of Orange in the mid 16th century. The Pug was also bestowed the position of the House of Orange official dog after one of its kind saved the life of William I by alarming him to the approach of an upcoming attack of Spaniards at Hermingny in 1572. Later, when William II landed at Torbay to be crowned King of England, his cortege included pugs, making the breed fashionable for generations. 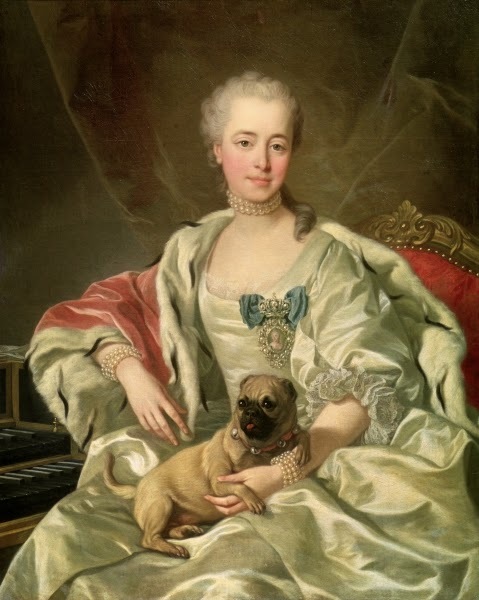 By 1790, the Pug had made its way to France. Most notably used by Josephine, wife of Napoleon, her pug, "Fortune," carried secret messages under his collar to Napoleon while she was confined in Les Carmes prison. 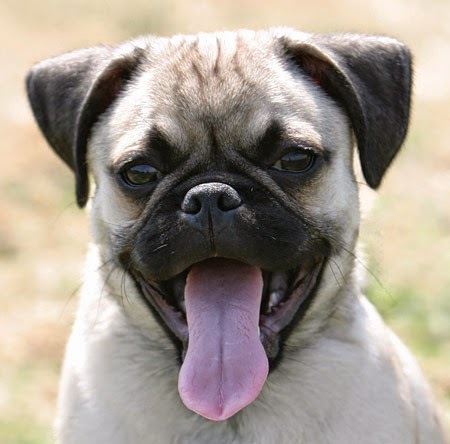 In England, the Pug gained popularity during the Victorian era. 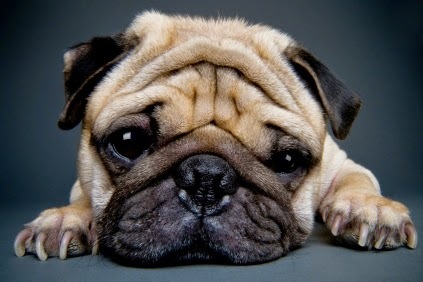 These pugs sported cropped ears, which further enhanced their wrinkled expressions. 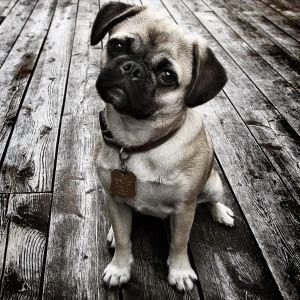 And in 1885, the American Kennel Club would recognize the Pug. Since then, the Pug has become not only a popular show dog, but a wonderful family pet. 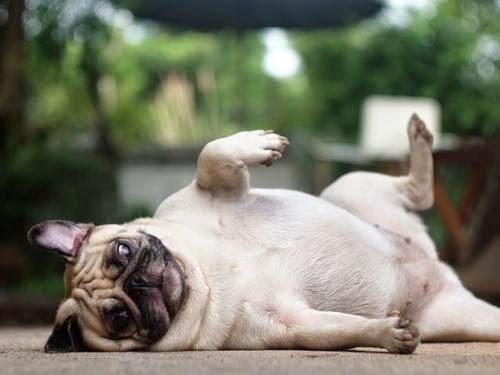 People may initially be attracted by the Pug’s unusual appearance, but they are quickly won over by his personality. He is a charming, fun-loving clown of a dog who doesn’t mind wearing a costume. It’s all in good fun, after all. Even dressed as a bumblebee, the Pug has a knack for retaining his dignity even while making people laugh. Pugs take well to training, too. That is, they will train you to spoil them appropriately. They love to eat, and it takes the strength of ten to resist a Pug’s pleading face when he wants one of your tater tots. Pugs have a reputation for being difficult to housetrain. But if you learn to read their body language, they will tell you when they need to go out. Is the Pug perfect? Well, no, not always. Any dog, no matter how nice, can develop obnoxious levels of barking, digging, food stealing, and other undesirable behaviors if he is bored, untrained, or unsupervised. Start training your Pug puppy the day you bring him home. He is capable of soaking up everything you can teach him. Don’t wait until he is 6 months old to begin training or you will have a more headstrong dog to deal with. If possible, get him into puppy kindergarten class by the time he is 10 to 12 weeks old, and socialize, socialize, socialize. However, be aware that many puppy training classes require certain vaccines (like kennel cough) to be up to date, and many veterinarians recommend limited exposure to other dogs and public places until puppy vaccines (including rabies, distemper and parvovirus) have been completed. In lieu of formal training, you can begin training your puppy at home and socializing him among family and friends until puppy vaccines are completed. The perfect Pug doesn’t spring fully formed from the whelping box. He’s a product of his background and breeding. Whatever you want from a Pug, look for one whose parents have nice personalities and who has been well socialized from early puppyhood. Coat care for the Pug is minimal, requiring only occasional brushing to remove the dog's dead hair. Meanwhile, regular cleaning and drying is necessary to prevent skin infections, especially in the dog's facial wrinkles. 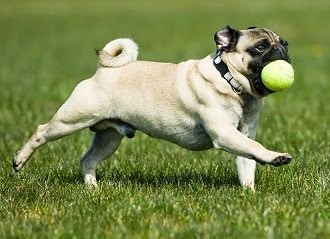 As far as exercise requirements, the Pug's needs can be met daily with a moderate leash-led walk or an energetic game. Sensitive to humidity and heat, the Pug should be kept indoors. The breed is also prone to snoring and wheezing because of their flat, small muzzles. Grooming a Pug’s coat is easy. Brush his smooth double coat weekly with a rubber curry brush to remove dead hair. And you will remove lots of it, because Pugs shed. A lot. They shed year-round, so it’s something you should expect to live with. Bathe the Pug as needed. With the gentle dog shampoos available now, you can bathe a Pug weekly if you want without harming his coat. Pugs make the best family pets — just make sure your toddler knows the difference between hugging and squeezing for the sake of those bulging Pug eyes. This breed requires low levels of exercise and makes a great apartment dweller. Although Pugs don't require multiple daily walks, they live for constant companionship. Pugs thrive with lots of human interaction so busy bees and travel enthusiasts might choose to opt out. 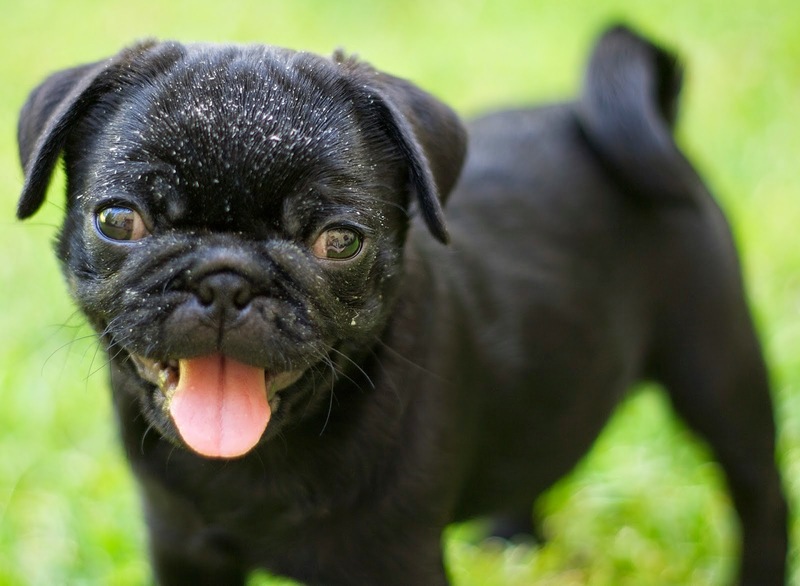 Despite their short coat, Pugs shed like crazy so get ready to find little Pug hairs everywhere. Allergy suffers and neat freaks, this may not be the breed for you. Among the Pug’s rich and famous admirers are King Louis XIV; Josephine, empress to Napoleon; Queen Victoria; the Duke and Duchess of Windsor; and fashion designer Valentino. No other dog provides a cuddlier shoulder to lean on as loyal Pugs make themselves available to you through thick and thin. They live to make you laugh with a mere glance at their goofy faces and their little curly tails. With an equally comical personality, don't count on this breed to sit in silence for too long; snorting, snoring and a multitude of questionable noises complete the Pug package and are a sure sign of a perfect day in the making.